Welcome to Day #5 of Chocolate and Coconut Theme Week. 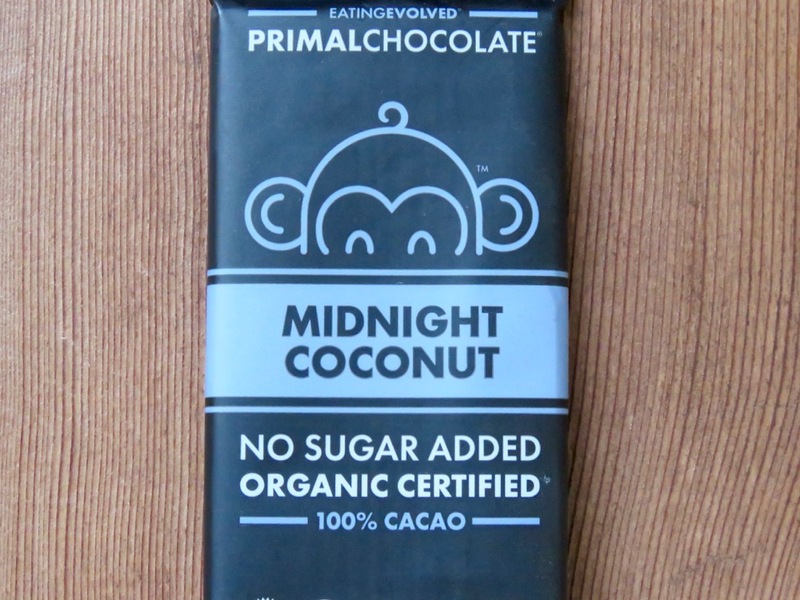 Today's 100% cacao, three-ingredient* ultra-dark Midnight Coconut bar from Primal Chocolate (Setauket, NY) was made without added sugar. But, wait; technically, the bar was not 100% cacao. It also included organic shredded coconut. This Midnight Coconut bar had a pleasant, natural coconut aroma, and broke with a pleasing snap. 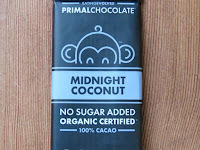 The coconut in this 100% cacao* bar gave the chocolate an almost crunchy texture. The aroma of a 100% cacao bar can be deceptively (and sometimes shockingly) sweeter than its bitter flavor. That was the case here. The brain is expecting something sweet when it smells chocolate and coconut, and the actual signals it received after the first bite were anything but. After the somewhat harsh bitterness, the finish was relatively more calm.